Why is a ship a she? But seriously: why are ships and countries (and sometimes cars and other vessels and vehicles) often referred to with the feminine pronoun? Although the practice has been in steady decline for some time now, thanks no doubt to feminism and PC journalistic style guides (the Chicago and AP manuals strongly discourage it, and even maritime authorities now frown on its usage), it’s nevertheless been historically ingrained in nautical language and lore for many centuries. One prosaic explanation is that the gender of the Latin word for “ship” — Navis — is feminine. But people generally agree on the more romantic notion of the ‘ship as a she’ phenomenon: that it stems from the tradition of boat-owners, typically and historically male, naming their vessels after significant women in their lives — wives, sweethearts, mothers. Similarly, and more broadly, ships were once dedicated to goddesses, and later also to mortal women of national or historic significance, thereby bestowing a benevolent feminine spirit on the vessels that would carry seafarers across treacherous oceans. 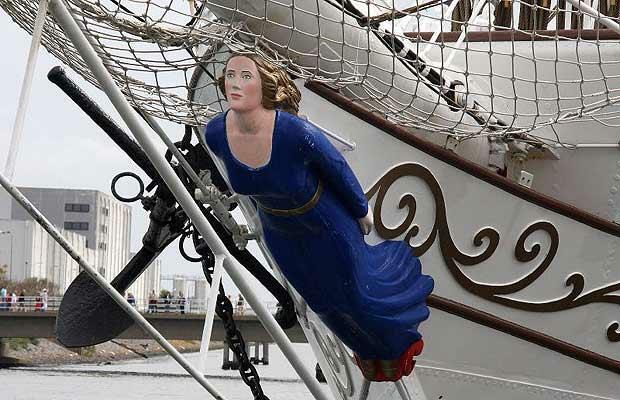 Figureheads on the prows of ships were often depictions of such female namesakes, denoting the name of the ship for a largely illiterate maritime population. This practice dated from the early 18th century, before which superstition had it that the presence of women aboard sailing vessels — whether in human or representative form — was an omen of bad luck. The practice of naming boats and ships after women continues today, although certainly not exclusively, as does the habit of feminizing our sailing vessels. Like ships, but with declining frequency, countries have historically assumed a female form in historical and literary contexts — especially when the author or speaker seeks to personify that country for rhetorical or poetic effect. The New York Times in February 1917 quoted the then editor of The Economist, Hartley Withers, discussing a nation contemplating war: “If America with all her treasure of gold comes into the war against Germany she will be of incalculable help to her allies, regardless of anything she may do as a fighting force. If she stays out, as now, with broken relations with Germany, she will be an equally potent support to us. America’s wealth and financial aid mean everything to the Allies.” National personifications of countries in female forms have been extremely popular over the years, especially in the context of wartime propaganda and patriotism: Brittania, Germania, Mother Russia, Marianne (for France), and Italia Turrita are but a few examples. However, male symbols of nations are not uncommon; John Bull (for the UK) and Uncle Sam (representing the U.S. government) are two notable exceptions to the female country rule. To personify a country in the female form, both linguistically and symbolically, is now something of an anachronism. But despite our gender-blind naming of diseases, hurricanes, storms and other forces of nature, we still bestow on our planetary home and the very core of our existence names of the ultimate symbols of life-giving femininity: Mother Earth and Mother Nature. “Ships are referred to as ‘she’ because men love them, but this encompasses far more than just that. Man-o’-war or merchantman, there can be a great deal of bustle about her as well as a gang of men on deck, particularly if she is slim-waisted, well-stacked, and has an inviting superstructure. It is not so much her initial cost as it is her upkeep that makes you wonder where you founder. “Even a submarine reveals her topsides returning to port, heads straight for the buoys, knows her pier, and gets her breast-lines out promptly if she is single-screwed. On departure, no ship leaves port asleep, she always leaves a wake. She may not mind her helm or answer to the old man when the going gets rough, and can be expected to kick up her heels on a family squall. “A ship costs a lot to dress, sometimes blows a bit of smoke, and requires periodic overhauls to extend her useful life. Some have a cute fantail, others are heavy in the stern, but all have double-bottoms which demand attention. When meeting head-on, sound a recognition signal; whistle. If she does not answer up, come about and start laying alongside, but watch to see if her ship is slowing . . . perhaps her slip is showing? Then proceed with caution until danger of collision is over and you can fathom how much latitude she will allow. “If she does not remain on an even keel, let things ride, feel your way, and do not cross the line until you determine ‘weather’ the “do” point is right for a prolonged blast. Get the feel of the helm, stay on the right “tact”, keep her so, and she will pay off handsomely. If she is in the roaring forties, however, you may be in the dangerous semi-circle, so do not expect much “luff,” especially under bare poles. This entry was posted in Etymology, Top posts, Words, phrases & expressions and tagged female country personifications, why is a ship a she on March 30, 2013 by Louise. In my sailing days it was explained to me that women carry life. Any vessel that can sustain life in an environment that people could not normally sustain life functions without her body should, appropriately, have a feminine name. Ships without a name are presumed to be cursed because they are thought to be barren. Wow never knew that Carlos. Thx for the info. I will use for my report. That is the best explanation I have heard. All transport is refered to as she because like a woman they carry. The tradition of representing nations as females have ancient roots. The Romans worshipped the goddess Roma as the embodiment of Rome. The Emperor Hadrian built a huge temple dedicated to Roma Aeterna (Eternal Rome) in time for the 900th jubilee of the traditional founding date of Rome. In the Eastern Mediterranean there’s also a temple with all the Romans provinces depicted as females (though they were probably not worshipped as goddesses, but as spirits). The Greeks also worshipped goddesses as an embodiment of the citizens/people (rather than the state as with Roma). Most famous of all were Athena and Athens but many other Greek cities also had their own goddesses sharing the name of the city. The character and naming of ships was absolutely NOT always female. The Romans already had various male ship names. In French, English and German various ship types are labeled male until today (eg le “petrolier” / der “tanker”. In Europe’s (“Germanic”) north, ship names were over most of its shipping history male: If you look up names of ships of the German Hansa League, of the Vikings or from medieval England, you will find male names, over centuries. Jens does not appear to understand the question. We are not discussing the naming of ships. There are plenty of ships names which are male. for example almost all the Destroyers in the United States Navy are named after individuals and the vast majority of them are male. Nor are we discussing the names of types of ships. For example ships of many navies were referred to as Men of War. The question under discussion in this conversation is the pronoun used to refer to ships which in English is “she”. What pronoun is used or ships in your language? This is just a holdover from old English when english still had noun genders. In old english ship was a feminine noun. Thus the pronoun was she. Because the bottom is always wet.